This computer peripheral set is specifically designed to appeal to younger users and fit smaller hands. 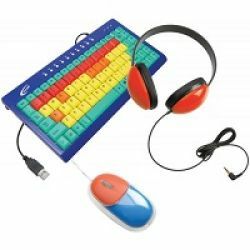 The award-winning Kids Keyboard has fun green color-coded function keys, red-colored number keys, orange-colored vowel keys, and yellow-colored consonant keys to build confidence in students as they learn how to efficiently type on a keyboard. The wide mini mouse has optical tracking for higher accuracy and ease of use. Listening First™ stereo headphone is perfect for students engaged in classroom story-time, read-along, library and computer-based activities. All are made from rugged ABS plastic for classroom safety and durability. Includes Kids Keyboard, Mouse & Headphone.